In previous years, Dexter has aired in the fall, which makes Comic Con a great time for Showtime to tease the upcoming season. But with Dexter's final season premiering last weekend, the serial killer drama is already underway. That doesn't mean we won't see Dexter at Comic Con this year. In fact, Dexter's going bigger than ever to celebrate its final season at the San Diego convention, with a panel set for Hall H, the biggest venue at the convention center. Showtime announced today that the Dexter panel will take place on Thursday, July 18 at 6:30 p.m. in Hall H.
KROQ entertainment reporter Ralph Garman presides over a revealing interview and Q&A session with the stars and executive producers of DEXTER. Featured panelists include, but are not limited to series star and executive producer Michael C. Hall, and series stars Jennifer Carpenter, David Zayas, James Remar, and special guest star Yvonne Strahovski. Also appearing are executive producers John Goldwyn, Sara Colleton, Scott Buck and Manny Coto. The DEXTER panel session will be presented on the first day of the world-famous gathering in San Diego on Thursday, July 18th in Hall H from 6:30 p.m. to 7:30 p.m. In partnership with Entertainment Earth and Biff Bang Pow, SHOWTIME will host signings and offer exclusive merchandise, all available at booth #2343. The announcement also promises "surprise guest stars, who are too big to mention." This is pure speculation here, but I'm going to guess Julie Benz and Jaime Murray as possibilities, as both are expected to be at SDCC for Syfy's Defiance panel. That's just a guess though, but given that Dexter's on its last season, fans would probably love to see two of Dexter's former ladies, though things didn't end so well for either character. We can also hope that some of the other cast members will drop by, including C.S. Lee (Vince Masuka) and/or Aimee Garcia (Jaime). We'll have to wait and see who shows up. By the time Comic Con happens, we'll only be through the third episode of the season, with the fourth set to air that Sunday night. 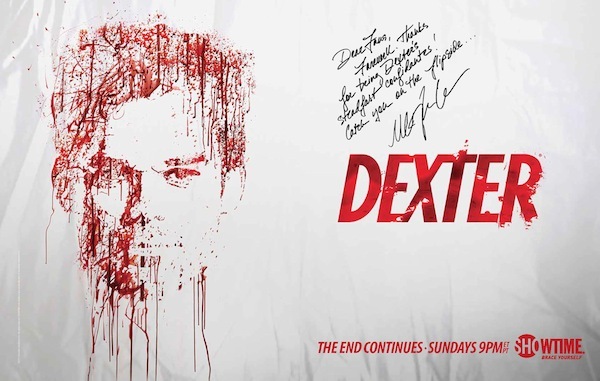 So there will still be plenty of season left to speculate over, and we might expect the cast and writers to share some insight into what's ahead and what Dexter and Deb are going through. Below is the bloody artwork Showtime shared with the SDCC announcement. It includes a special message from Michael C. Hall to the fans of the series. click the thumbnail at the bottom of the article to view the larger version. Dexter airs Sundays at 9:00 p.m. ET on Showtime. If you haven't seen the first episode of Season 8, check it out below and read our breakdown of Season 8's premiere here.